A sticking-out selfie camera, anyone? ZTE has produced concepts for the upcoming ZTE Axon V and Axon S, and the images show both smartphones have novel camera locations that we haven’t seen before. The images, submitted by ZTE to the IF World Design Guide awards in the Design Excellence category, show the Axon V and Axon S (as well as other ZTE handsets like the Axon M and the Blade 9) in all their glory, and we can see the bizarre camera placement in great detail. What 5G phones are we expecting to see? The Axon S, a sliding phone ZTE has planned for later this year, is shown to slide sideways, instead of upwards like previous sliding phones. The concepts show the phone in this open state and reveals a tri-lens camera setup, which the image description states totals 48MP and supports 5x optical zoom. 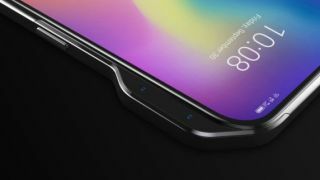 The concept description also mentions that the phone will have a 95% screen-to-body ratio, with the display housing an in-screen fingerprint sensor and 3D camera. This will likely be an in-screen camera, possibly similar to what Samsung is planning in future Galaxy phones. The Axon V also has an intriguing design – it’s not a sliding phone, and looks mostly like a standard Android handset, except for the fact that its dual selfie cameras are housed in a small wing-like appendage that protrudes from the top-right of the device, creating an asymmetrical outline. We’re not quite sure what to make of this novel arrangement, although it doesn’t look like it would be very comfortable in a pocket. As well as the unusual design, the Axon V has another distinguishing feature: it’ll have 21:9 aspect ratio, a screen format we’ve only seen recently in the Sony Xperia 10 and 10 Plus. The screen is an 6.8-inch OLED panel, which is bigger than either of the Sony Xperia 10 phones, and like the Axon S will house a 3D front-facing camera. Since the concepts come from ZTE itself, rather then being leaks, they’re likely to reflect the finished phones, giving us our first real look at the two devices. Both are set to launch at some point this year, although “2019” is the only release date we have so far – we’ll keep you updated with all the latest news and rumors about the phones until then.